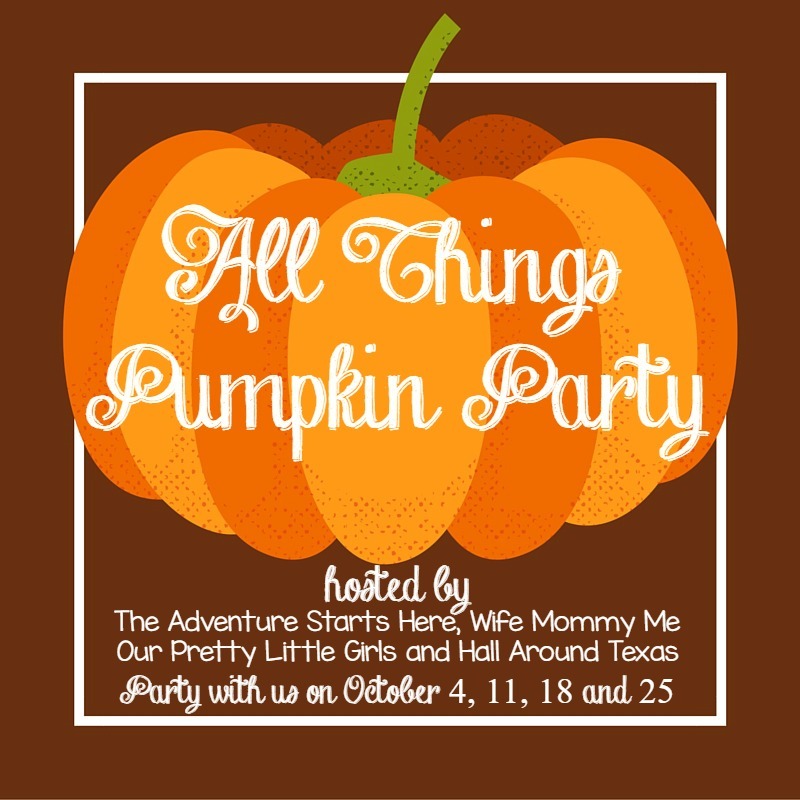 The Adventure Starts Here: Fall Home Tour 2016 | "All Things Pumpkin Party" Announcement! 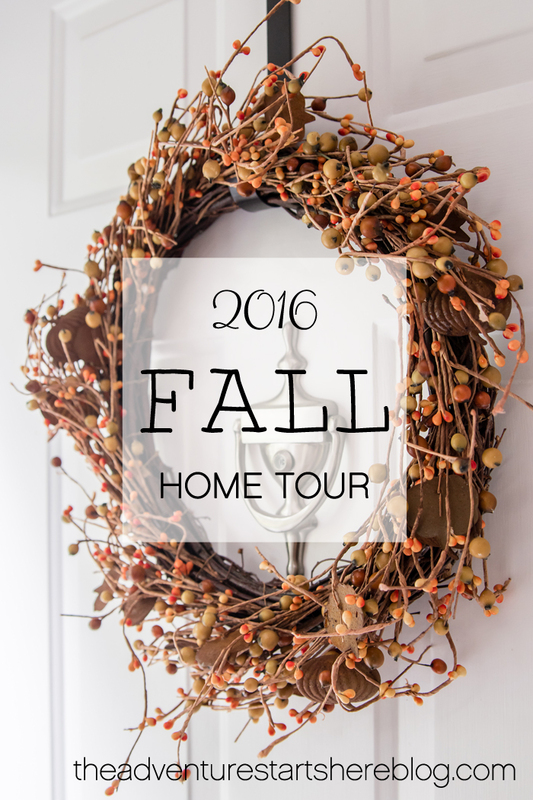 Fall Home Tour 2016 | "All Things Pumpkin Party" Announcement! Good Morning Friends! 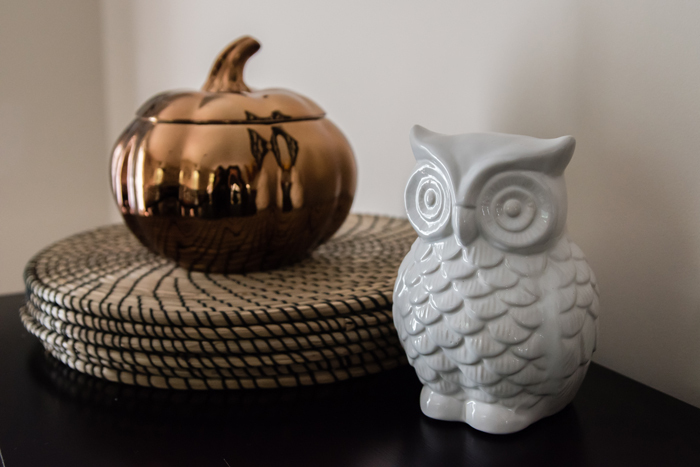 One of my favorite things about the seasons changing is making small tweaks to our house and decor. I love bringing in more neutrals in the Fall, pastels in the Spring, and lots of red and metallics at Christmas! 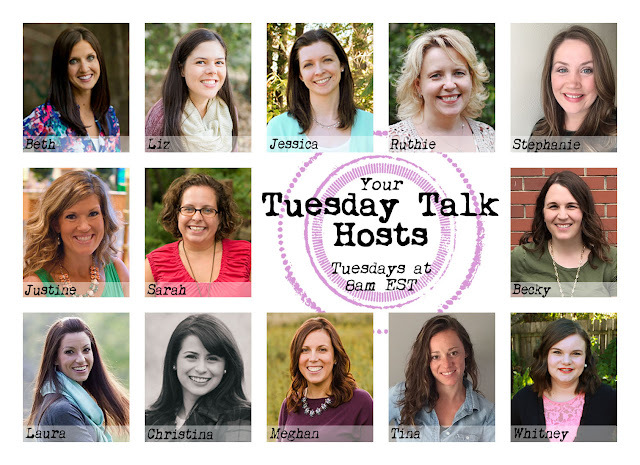 Another one of my favorite things to do is to peruse Pinterest and go on virtual home tours. I really enjoy seeing how others decorate for each season and holiday. So today I thought I'd share how I decorated our house this Fall for all of you who are just as nosey curious as I am! 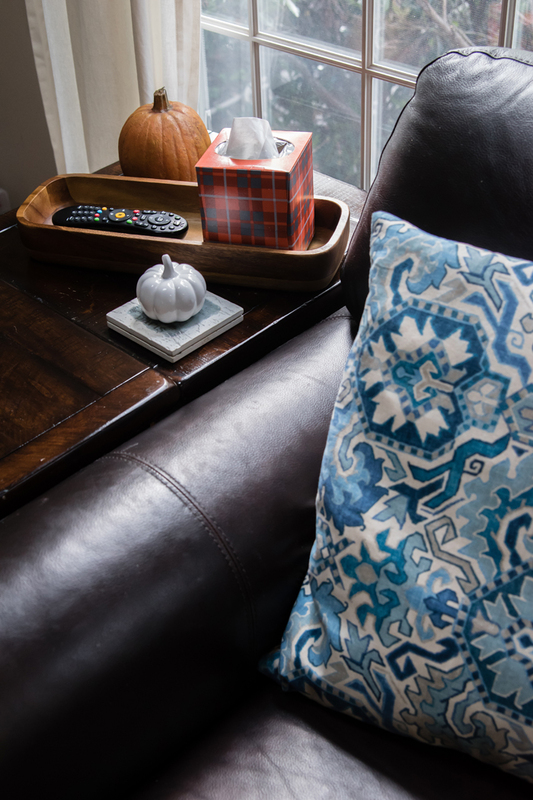 As I do every year, I like to buy a few new things to incorporate with my old favorites in new ways. I love moving things around and finding new ways to display some of my favorite pieces. So while I tried to provide sources and links as much as I could, many of my decor pieces are from previous years and no longer available. When walking into my house, the living room can be seen right away. This sofa table acts as a separation, creating almost a hallway to the rest of my house. It also stores Noah's shoes and our winter hats and mittens (not yet, not yet!). I like adding a few seasonal touches to it, but also leaving some space since it's often a landing zone when we walk in the door. 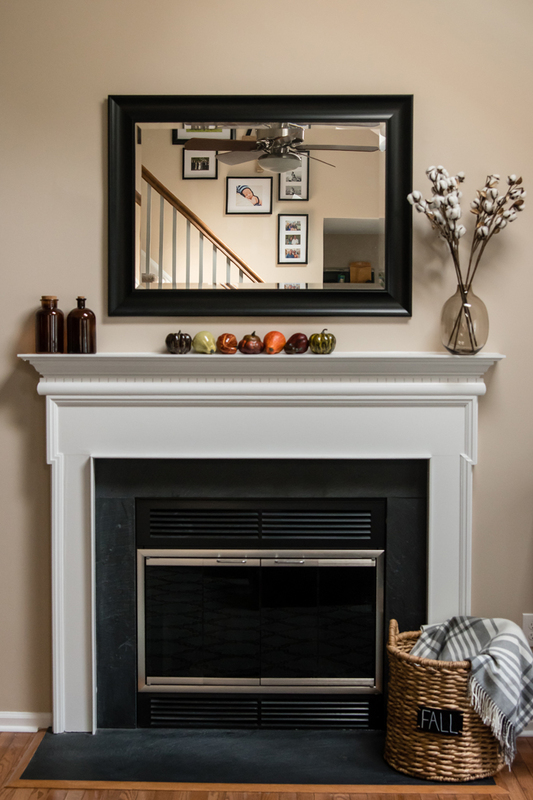 The mantel is one of my favorite things to decorate. When we lived in an apartment, I longed for a fireplace... not for the fires, but for the mantel! This year, I decided to keep it very neutral and a little more simple than last year. 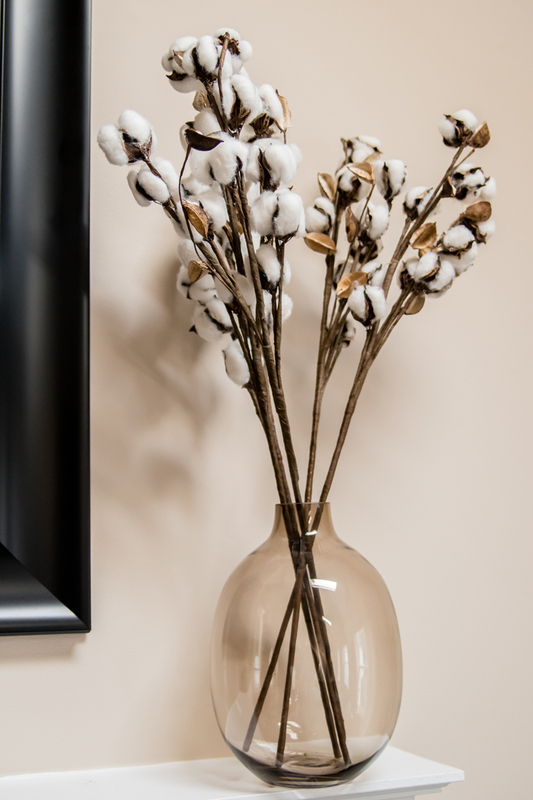 I found these brown vases in the Target Dollar Spot, the fake gourds are from last year, and I used one of my favorite vases, but updated it with some new stems of cotton. ^^^ and can I tell you how upset Noah got over this basket? It usually says Noah (which it still does on the other side) and it's usually located near our sofa table. He noticed right away that is was moved and at first didn't care. But then when he was playing, he all of a sudden said "Why doesn't this say Noah?". I told him to turn it around, but apparently that wasn't enough. The tears began and not only did he want me to erase "Fall" and put "Noah" back on, but he also told me to put it back where it was before. This kid clearly doesn't like change! 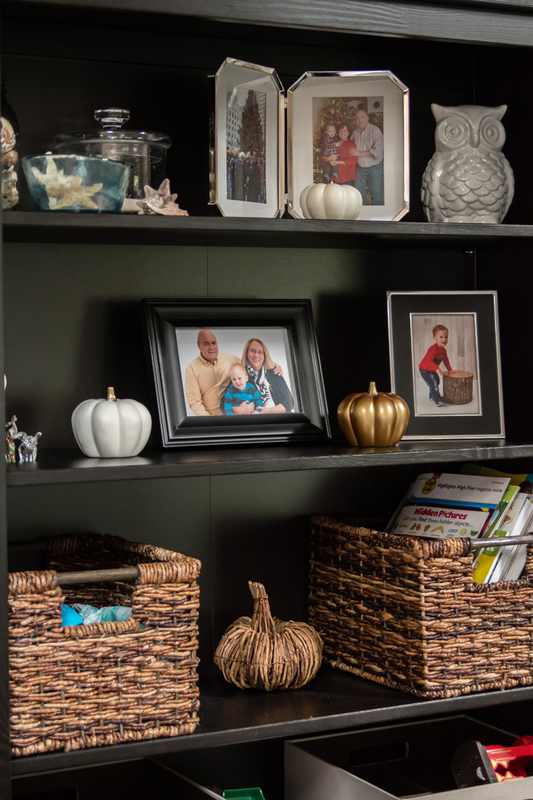 Other than that, I kept our living room practical, and just added a bunch of pumpkins on side tables and bookshelves. In a few weeks, I will swap some of these regular pumpkins out for some jack-o-lanterns. Next up, I added a few seasonal touches to my dining room. We don't have an eat in kitchen, so this is our main eating area. Because of that, I wanted to keep it functional and not set a formal table. Instead, I keep a stack of rattan placemats on the sideboard so we are ready for family meals. 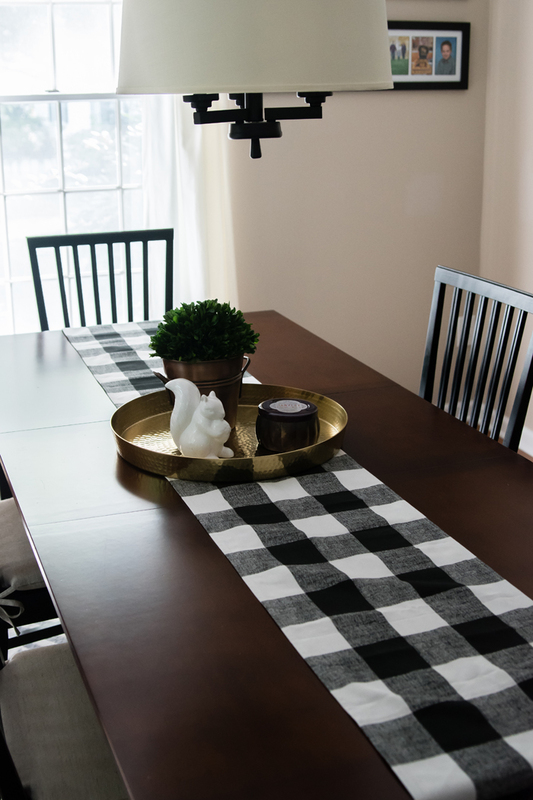 I kept the table simple with a buffalo check runner and used this gold tray to corral a few simple decor elements. It's the perfect combination for me... decorated, but still practical for the every day. 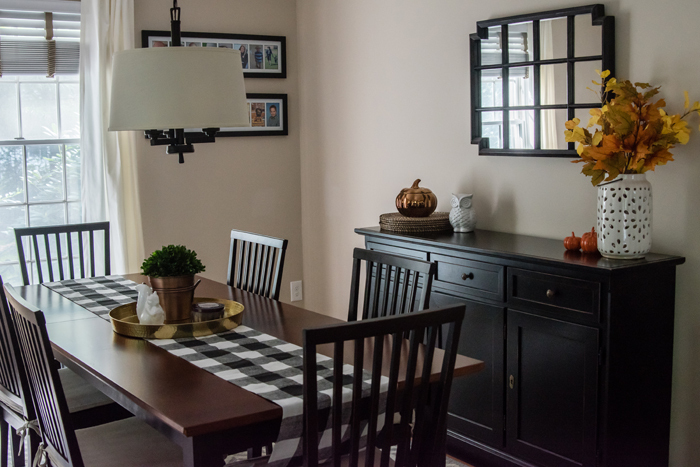 We can still enjoy family meals here, but it's also a clear space for us to play board games and put puzzles together on! 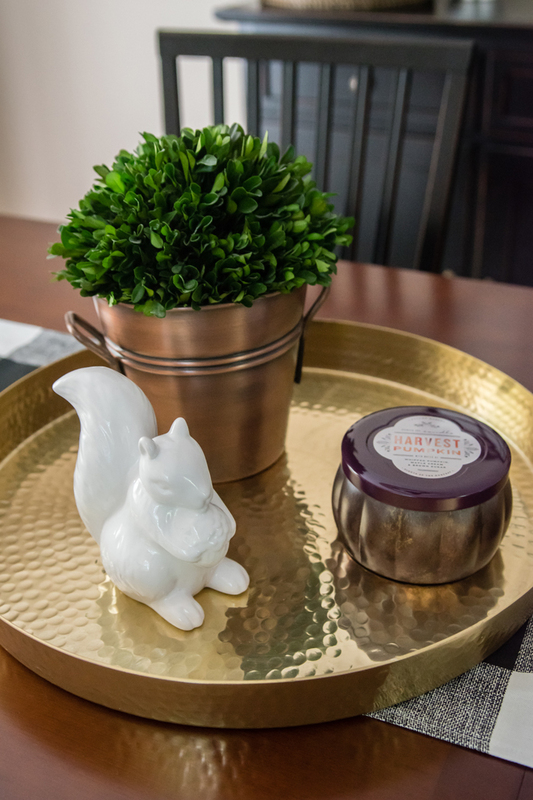 ^^^ Noah picked out the squirrel in the Target Dollar Section. It was between a squirrel and fox, and honestly both would have been super cute! Other than the stack of chargers, I added some warm touches with the orange and yellow stems, a white owl, and orange pumpkins. While I love having fresh flowers in my house, when it comes to stems of leaves, I prefer to use artificial. There's just something about bringing stems in from the trees outside my house that makes me worry I'm gonna be inviting the bugs in! Other than that, I love using smell to really make it feel like Fall! 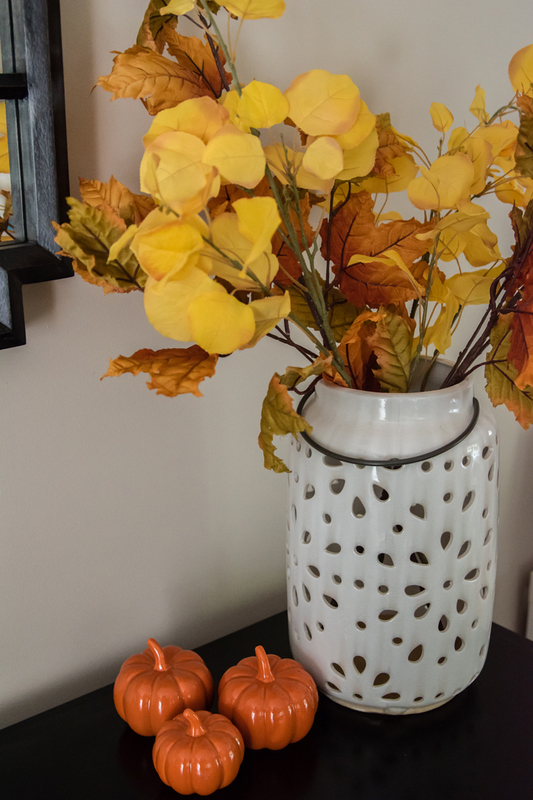 A potpourri filled pumpkin in the bathroom and a Fall candle in the kitchen. 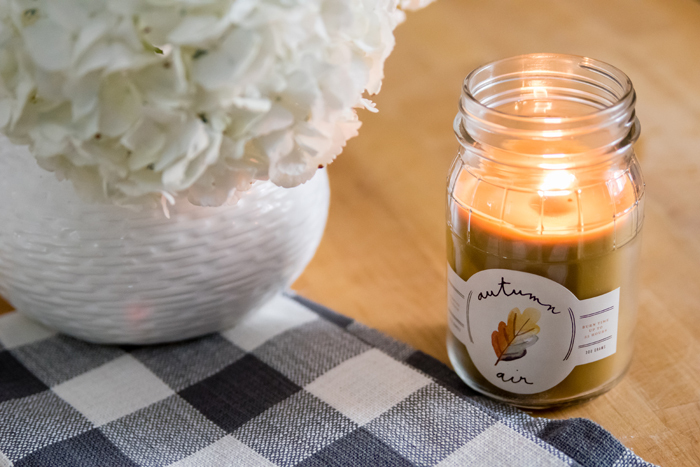 There's nothing better than the smell of Fall filling your house! 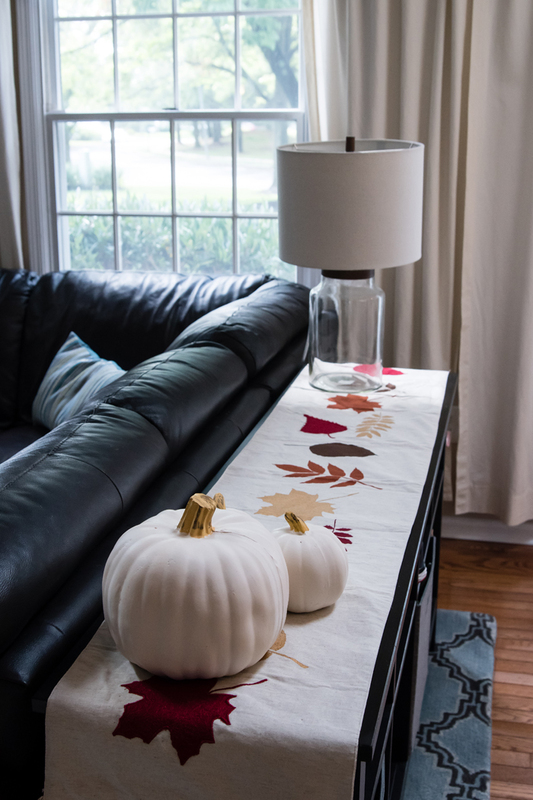 Do you switch up your decor depending on the season? 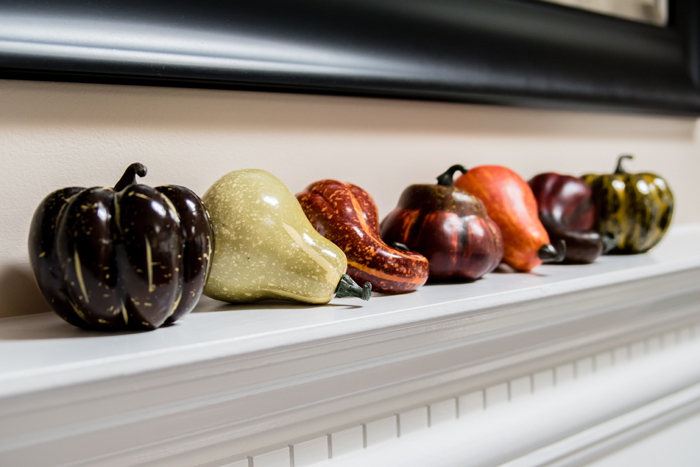 How do you like to decorate for Fall? As you can tell, when I think Fall, I think pumpkins! 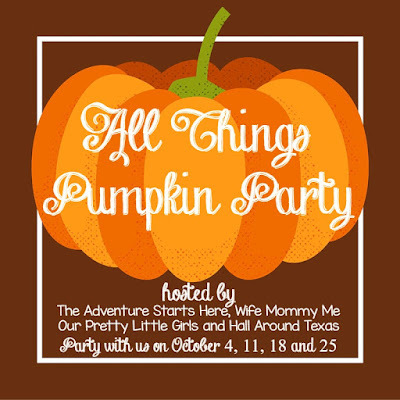 So what better way to celebrate the Fall season, then with an "All Things Pumpkin Party"! Every Tuesday in October, we (Wife Mommy Me, Our Pretty Little Girls, and Hall Around Texas) will share something pumpkin themed... a craft, recipe, DIY decor project, homemade beauty product and so on. Anything goes, as long as there are pumpkins involved... it's really that simple! And since I highly doubt I'm the only one obsessed with pumpkins right now, I would love for you to join in with the pumpkin fun and link up with us! Just grab a button and meet us back here starting Tuesday, October 4th! Love all of your decorations. So simple, yet very fall. The link up will be awesome. Looking forward to linking up. So pretty and so simple. I LOVE it so very much. I am left completely swooning over your table runner too. It is SO pretty. Very nice decorations! I usually just change up my entry way decor, and I love my fall things. We have our TV above our mantle so I don't decorate there, but I love how yours looks! I love how bright and light your home looks and feels. I love how you've sprinkle decorations throughout your home. Meghan, you need to be an interior decorator! 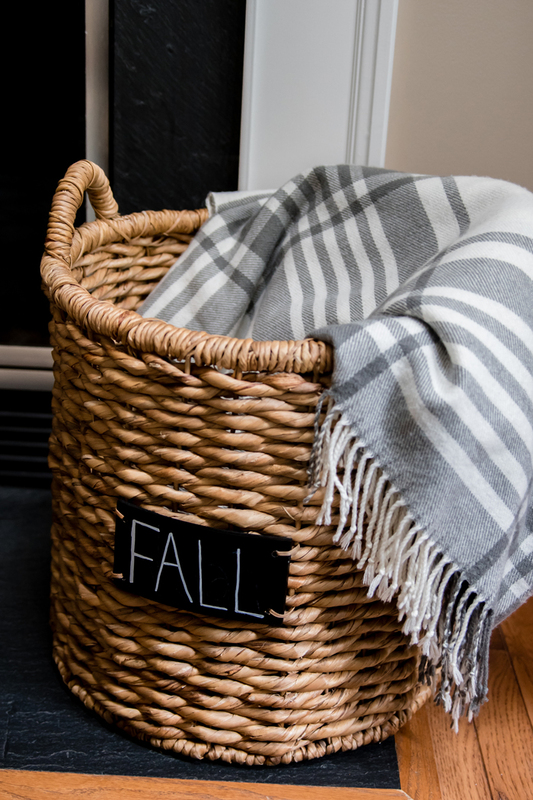 Love all your fall touches! 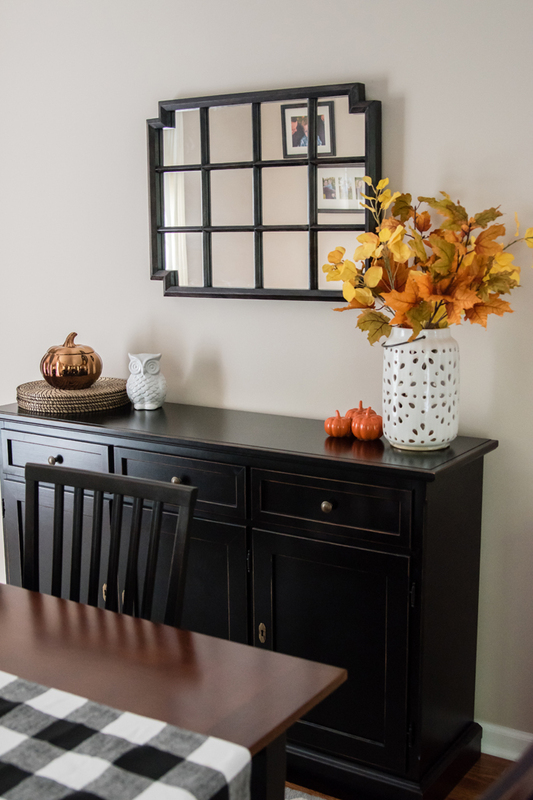 I love all of the fall touches around your house! 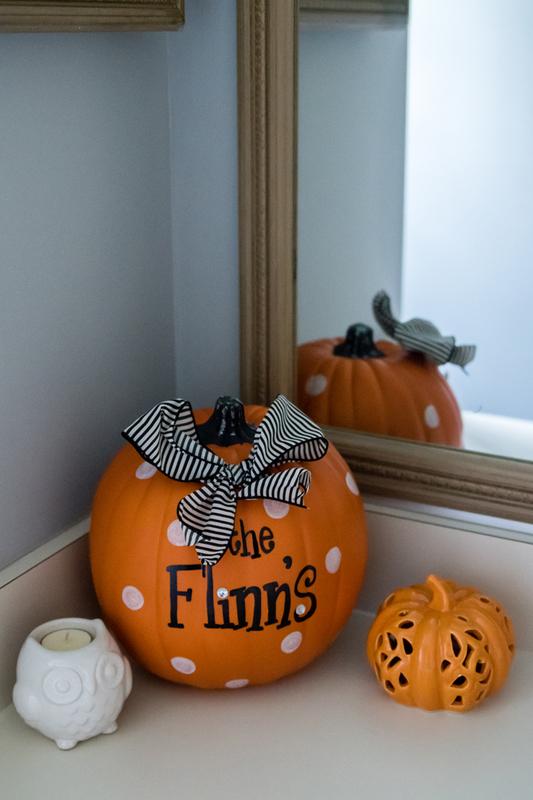 I looked at this earlier, but didn’t comment because I had to rush off to Hobby Lobby to recreate something similar to that pumpkin you have with your last name on it! Love it! 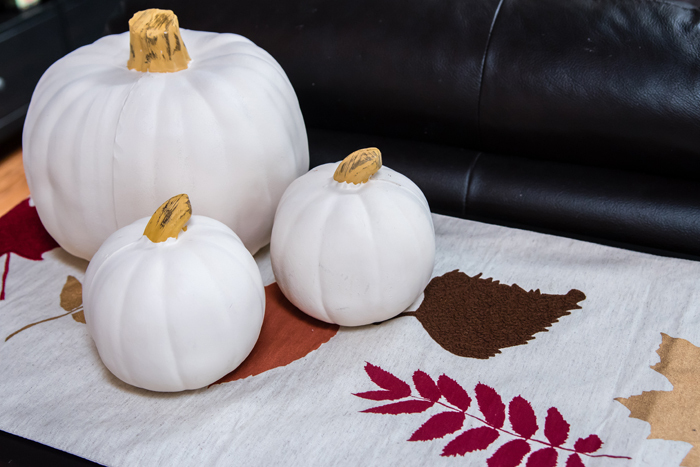 Also loving those white pumpkins! So funny that Noah noticed that the basket didn’t have his name on it anymore! Is he good with it now? Looking forward to the linkup! Loving all these simple touches. 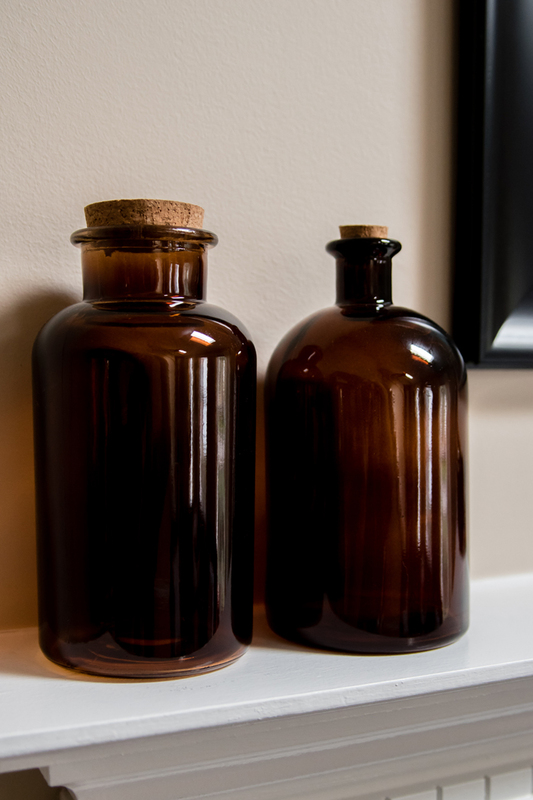 Adore that brown glass vase. Love all your little pumpkin touches!! perfect!